Mobile users will be able to access BBC Sport's live TV coverage from Aintree for the first time this week. 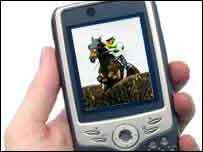 All three days of the Grand National meeting will be made available in a public trial via a mobile handset. 3G users and those with Internet-enabled PDA's and mobile phones (WAP) can watch the action, with WAP coverage starting on Friday. While the BBC will not charge to acccess the coverage, your operator will charge for data downloaded. If you have a 3G video-call phone, simply dial 62750 and click your video call button to view the live broadcasts. The BBC does not charge for this service but your mobile operator will charge you for the video call. Charges vary but this could cost you from 50p per minute. If your device has a GPRS or WI-FI connection, surf directly to http://www.bbc.co.uk/mobile and follow the Grand National video link. To receive a direct link to our WAP video service, text the word "National" to 81010 and click on the link in the text message. Please note, not all phones support this service and each message sent to the BBC will cost 12-15p (network charges vary). The BBC does not charge you or your network operator to access the clips. However if you have a GPRS connection, your operator will charge you for the amount of data you use. We strongly advise you to contact them to establish how much the data is likely to cost as charges can vary widely. 'Pay as You Go' customers accessing this trial may be charged up to £1.50 per minute by their networks and while contract charges will be considerably lower (approximately 22-25p per minute), please ensure you fully understand your payment plan before using this trial. If you have an Internet-enabled phone, you can access the Grand National video via the BBC WAP Homepage (http://www.bbc.co.uk/mobile). Simply follow the links to view the live broadcast. This service supports both low and high quality clips. To receive a direct link to our WAP video service, text the word "National" to 81010 and click on the link in the text message. Please note, not all phones support this service and each message sent to the BBC will cost 12-15p (network charges vary). The BBC does not charge you or your network operator to access the clips. However, your operator will charge you for the amount of data you use. We strongly advise you to contact them to establish how much the data is likely to cost as charges can vary widely. Please note that the BBC cannot respond to all feedback received.